Streamline your workflow by transporting your fully-built camera rig from studio to shoot. 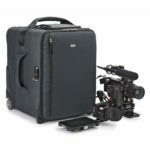 This durable rolling bag offers a large customizable interior to fit today’s professional ENG video rigs. Built tough with the quality Think Tank is known for, these rollers are the perfect blend of protection and functionality.